When I was a kid, I hated anything high or fast; so, out were roller coasters, ropes courses, and ziplines. However, as an adult, I’ve come to really enjoy ropes courses and ziplines. So, it was with much excitement that my wife and I booked a zipline tour with Flight of the Gibbon in Chiang Mai, Thailand. 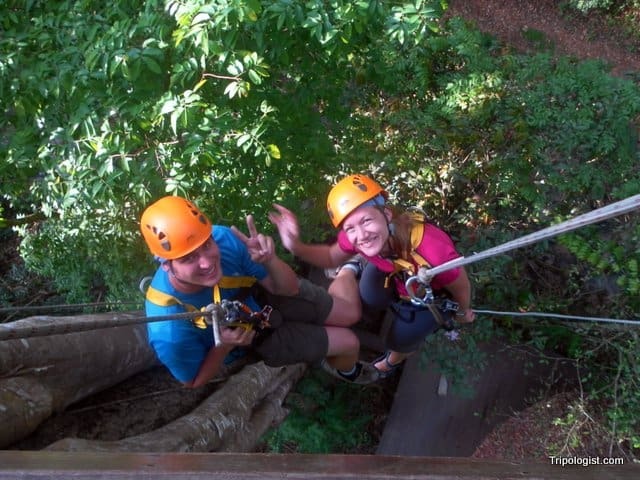 Flight of the Gibbon is an eco-tourism company that promotes its zipline tours as “The Real Rain Forest Adventure”. Their course was designed by a New Zealander, and the safety of the course is closely monitored by experts. 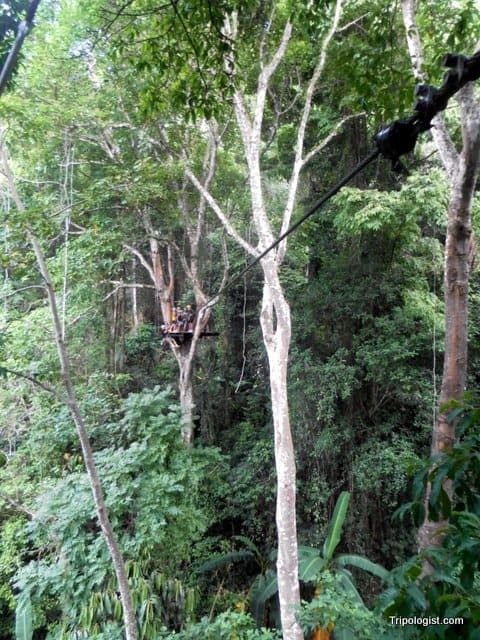 They offer ziplining tours from Chiang Mai, Bangkok, and Pattaya, Thailand. It is also possible to book multi-day trips with a home stay in the local village. 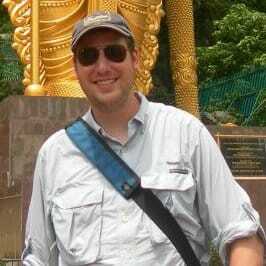 To start our tour, we were picked up in downtown Chiang Mai, and, after collecting the others in our group, headed out of the city for the hour long ride to the Flight of the Gibbon base. Looking at the next zipline platform at Flight of the Gibbon. When we arrived, the first step was to fill out a waiver form and put on our harnesses. We also dropped our bags off in the provided lockers, but I made sure to tuck my camera safely into my pocket. If you forgot your camera or don’t feel comfortable bringing it along, the guides take pictures of you that you can purchase later at the gift shop for the current price of 300 Baht a photo (about $10 USD). After a short ride to the course’s starting point, we were given a brief safety demonstration. Our four guides then broke us into two groups. Our first zip was quite short and a nice way to start the day off. The lines quickly increased in both speed and length, and soon we were at the longest forest zipline in the world. 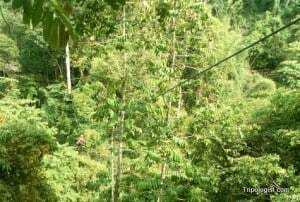 At 800 meters and several hundred feet above the valley floor, the zipline had nearly everyone screaming with joy as they zipped through the jungle canopy. All told, we spent about 2.5 hours in the canopy flying between stations, rappelling, and walking across a few swinging bridges as well. After our time in the canopy was over, we were driven to a beautiful tiered waterfall, where we had a self-guided tour that lasted about 30 minutes. Finally, we headed to a restaurant located across from the main office where dinner was provided. The food was decent, but not amazing, and was accompanied by three musicians playing traditional music. They had drinks for sale, but an included drink would have been nice. Overall, I really enjoyed my experience with Flight of the Gibbon. The ziplines were fun and the guides were excellent and very humorous. However, despite their humor, it was clear that the safety of the guests was their top priority, and I always felt safe during our adventure. The safety standards definitely appeared to be on par with the standards you would expect in America, Canada, Europe, Australia, etc. Flying through the air at Flight of the Gibbon. If I had any criticism, it would be that I feel the brochure and website make a few overzealous claims. For example, while the dinner was good, I wouldn’t describe it as “5 star”, and, while the guides were excellent, they didn’t provide us with information about the flora and fauna of the area. That being said, Flight of the Gibbon was a fantastic experience that I would do again in a second. The cost of a one day zipline tour is 3,299 Baht (about $110 USD), which includes pickup/drop-off at you hotel, all the ziplines, a meal, and a trip to a nearby waterfall. Disclaimer: In exchange for writing this review, Flight of the Gibbon provide my wife and I with half-price tickets. 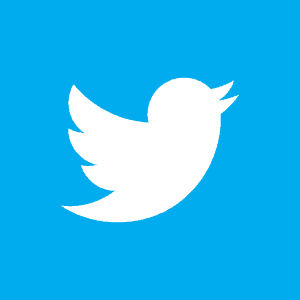 However, the opinions expressed in this article are my own. I was able to do some ziplining in the cloud forests of Costa Rica: an unforgettable experience. Missing out on learning about the local flora and fauna would’ve been one of my favorite parts of the experience, so I’m sorry you missed out on that. Glad you had a good time ziplining and nice to know it exists in other rainforests throughout the world. I’ve heard there is ziplining in Costa Rica, too. If I ever make it there, I’ll have to check it out. Thanks for the comment. We’re so glad you enjoyed your time with us at Flight of the Gibbon! See you next time! We did a similar thing along the Great Ocean road in Melbourne.. well Victoria.. It was a lot of fun, especially after the initial fear had passed! Didnt realise you could do Zip lining in Thailand! This will be on our to do list for the next trip!